“It was my pleasure selling Judith Dickson her first condo. From the very beginning she was a very competent buyer. Judith researched all the available types of mortgages available to them her what their interest rates were, from a conventional variable or fixed rate, to an FHA, CHFA or VA loan. In addition she hired a home inspector to insure her that all items as represented by the sellers’ residential property disclosure report were in working condition. 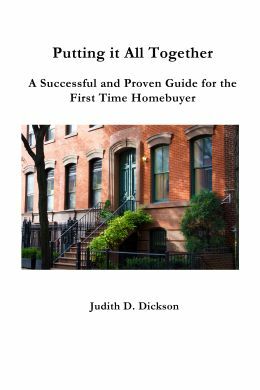 Lastly she chose a Real Estate Attorney who was an expert in the laws of closing a sale, and learned about her obligations as a buyer regarding attorney’s fees, title search, and closing costs.I would highly recommend you read this book by Judith Dickson if you are intending in purchasing a home.”-Sally S. Kirkutis, Broker/Owner, S. K. S. Real Estate Co.